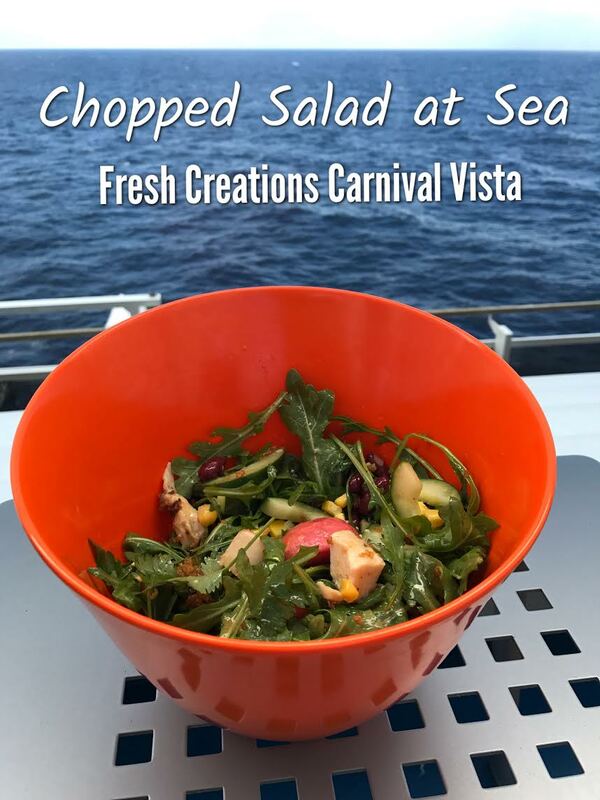 When I first started researching the Carnival Vista, one of the many things that caught my attention was the Fresh Creations Chopped Salad station located at the Serenity Deck offered only during days at Sea. It’s like a salad bar on steroids. I can honestly say if Carnival offered this every day vs. days at sea, I would probably eat here on a daily basis. I had the hardest time selecting what salad I wanted to build. I was an adult in a kids non-candy store. I ended up with: Arugula, Pickled Radishes, Pickled Red Onion, Corn, Cucumber, Kidney Beans, Crispy Quinoa, Cilantro and Herbed Marinated Chicken with Moroccan Vinaigrette. We took our salad back to our room and ate it from our balcony. The salad bowls fit in our room’s mini fridge which made a perfect mid-afternoon treat!